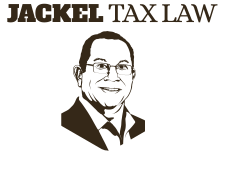 Jackel Tax Law provides opinions and federal tax law tips written exculsively by Monte Jackel with his 35 plus years of experience as a federal tax practitioner and former government official. Monte has worked on projects relating to partnership taxation, corporate taxation and international tax and stays at the forefront of current legislation and policy. To provide stimulating and thought-provoking analysis, opinion and commentary on important federal tax issues of the day.